Your personal brand can be the most critical component in receiving your next referral for a job or new business. When people visit your profile, you’re 1-click away from your next opportunity or one scroll away from being passed up for your competition. As our digital world is rapidly evolving, so the importance of your digital presence. Today, your online personal brand carries as much weight as your resume or many of your life’s work. This means the mistakes you’ve made or are making, may not reflect who you are at all. But for potential profile visitors, your profile is the first point of contact—which can potentially cause them to work with you…or not. In this class, we will cover 5 common personal branding misconceptions and some simple fixes that you can do immediately to make sure your 2019 starts off with the people you should know. 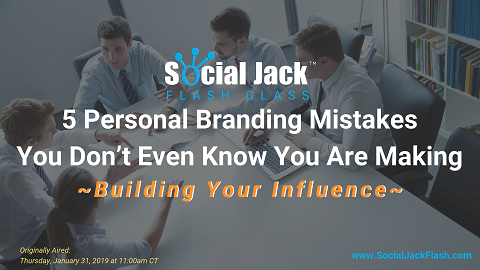 Learn from the best who have trained and coached 120,000+ professionals on how to distinguish their personal brand online and get their brand known. Dean DeLisle and the Social Jack™ Team have put together a quick easy-to-follow formula to know what to focus on first. What digital areas to change first. How and where to make necessary changes immediately. Next steps to Digital Business Influence for 2019.